Bring some life back into your existing kitchen cabinets with a fresh coat of paint! Painting is a process. 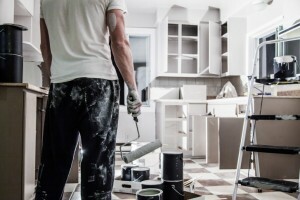 It doesn’t matter if you are painting your living room, bathroom, deck, or your home’s cabinetry, painting always requires a fair amount of planning and preparation. Did you know that repainting your home’s cabinets is a great way to update your kitchen? It is also much cheaper than replacing your existing cabinets. Here are some helpful tips for painting your kitchen cabinets and some of the most common mistakes you will want to avoid! Don’t make the mistake of trying to rush through your paint project. This will only lead to poor results. It is imperative that you dedicate plenty of time to your painting project. If you are new to painting, you may be surprised how long a DIY project can end up taking you. On average, it takes approximately four to seven days to repaint a kitchens cabinetry. With that said, make sure you are allotting enough time to tackle your project with precision. Many homeowners neglect this necessary step because they feel it is not essential. It is a good idea to remove any cabinets and doors before you begin painting. You will want to be sure to label the cabinets, so you know how to replace them back to their original spots. You will also want to bag all hardware and keep that separate as well. If you skip this step, your cabinets will be more prone to chipping down the line. Before you can pop open the first can of paint, you will want to prepare the wood. Take some grease cleaner and wipe down your cabinets. This is an important step if you are going to be using a water-based paint. You want the paint to stick well to the surface. It is also a good idea to dust down all areas of your cabinetry. This is because dust will leave an unattractive texture to the paint. If you want to achieve the best results possible, ensure you are taking all the necessary steps!